I start this blog to share my passion for halo and Wargaming. In the last year I was finally able to buy several miniatures from the halo Actionclix (and later Heroclix) sets, building a small collection of miniatures. After playing using the original rules from Actionclix I find myself thinking that this game could be improved and balanced a little more. For one year the miniatures was sitting on my desk until this year I started to work on my own set of rules to play a halo Wargame. 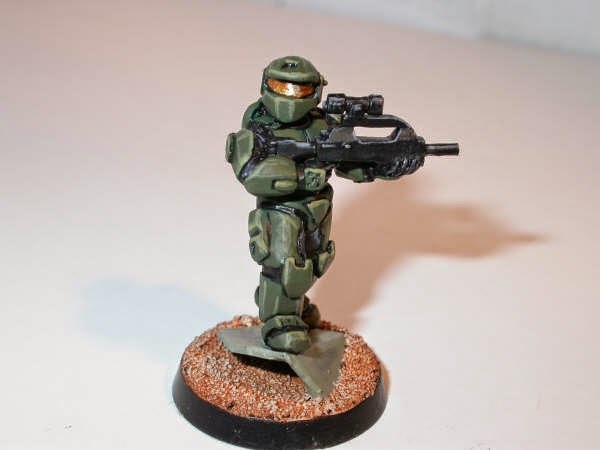 The main goal of this blog is build a complete set of rules to be able to bring our favoured sci fi universe (I hope you love Halo as much as I do) to the tabletop. My starting point for this game was the rules created by Wizkids for his game of Halo Actionclix. I found that was a great game, with a balance problem but good points, mix with the Halo Interactive Strategy Game (by Genius Products). I also use alot of inspiration from Star wars miniatures game (from wizards of the coast) and Warhammer 40K. This means that you will find many familiar terms in this rules, I wasn't looking for originally, my goal is FUN. Where to get the miniatures? You can use the original Halo Actionclix miniatures, build your own miniatures or even use the halo Megablocks line of figures to play this game, as long as you have a consistency on size of the miniatures all is valid. This rules are build taking on mind miniatures of 28 mm (standard size), but in later post I will put tables for converting sizes to other scales (if you want to use the halo micro ops to play will be an option).